Tag Archive for "producers" | CertiFYD Production Group | Music Producers that have worked with Eminem, Neyo, Lil Wayne, Rick Ross, Keyshia Cole, Remy Ma, Meek Mill, etc. 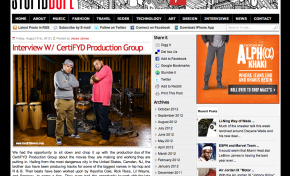 CertiFYD Production Group – We had the opportunity to sit down and chop it up with the production duo of the CertiFYD Production Group about the moves they are making and working they are putting in. Hailing from the most dangerous city in the United States, Camden, NJ, the brother duo have been producing tracks for some of the biggest names in hip hop and R & B. Their beats have been worked upon by Keyshia Cole, Rick Ross, Lil Wayne, and Freeway, to name a few. They even had the opportunity to work with the late legend Heavy D before his untimely passing. We spoke about how they got started in their craft and how they have managed to make a name for themselves in such a short time span. You’re probably more familiar with the duo than you think, but now would be a great time for you to become a little more familiar with the fellas of CertiFYD. Check out the interview below, as well as some video’s from the fellas as well. How & when did you get started making beats? Jay: We started really getting serious about music production in 2006. We started making tracks on the Yamaha Motif and Protools. Pi: I actually started on Fruity Loops for a little bit but after we got the Yamaha Motif and Protools the rest was history.